At the start of the final day’s racing “Stella” and “Lighthorse” were locked together on 7-points at the top of IRC Division with “Moll” lying in third place. “Stella” and “Lighthorse” were seen in close combat but it was “Lighthorse” that secured top honours with a first and second place finish on the final day to win her first Summer Saturday Series. “Stella” had to settle for second place with “Moll” picking up 3rd place. In HKPN “Kiasu”, with a 6-point advantage going into the last two races could afford to take things a little easy and coming in 3rd and 4th respectively in the last two races was enough to secure the top prize finishing on 15-points. Second placed “Jazz” made great effort to close the gap winning the first race but in the second race, all “Kiasu” had to do was stay in close proximity to “Jazz” to take the Series win. She did that by finishing in 4th place just ahead of “Jazz”. “Bits & Pieces” has been very quiet this series but still performed well enough to take overall 3rd place. In the Sportsboat Division the close contest between “Merlin” and “Red Herring II” continued but it was “Merlin” that clinched the series with two further 1st place finishes. “FreeFire It’s My Pleasure” missed one more race than “Ricochet” allowing “Ricochet” to push into 3rd place. 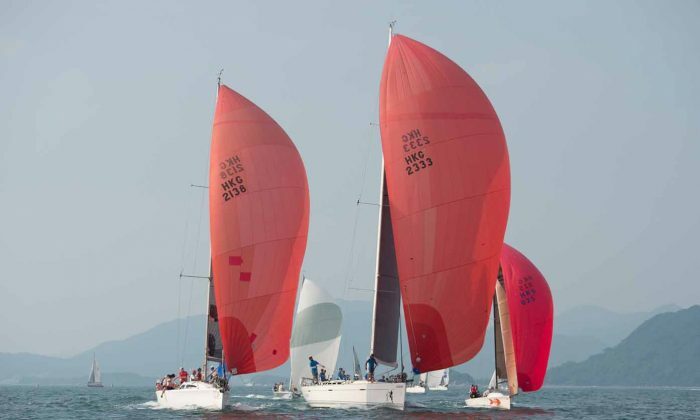 In the Dragon Class, “Puff” out-sailed “Maiden Hong Hong” on the final day of racing and pulled up to equal “Maiden” on 17-points but “Maiden Hong Kong” just managed to stay ahead on count-back by recording better performances early in the series. “Phylloong” took 3rd place although “Zephyr” with first and second place finishes on the final day closed the gap. In the final race although “Zephyr” led on the first circuit, “Eaux Vives” put in a strong final lap to win the race. IRC: “Lighthorse” (11), “Stella” (13), “Moll” (25), “Talkinghead” (27), “Vixen” (29), “Goddess” (46), “Avant Garde” (48); HKPN: “Kiasu” (15), “Jazz”, (20) “Bits & Pieces” (23), “Ichiban” (26), “Jelik VII” (35); Sportsboats: “Merlin” (9), “Red Herring II” (11), “Ricochet” (29); “FreeFire It’s My Pleasure” (35), “Stingray” (43); Dragon: “Maiden Hong Kong” (17), “Puff” (17), “Phylloong” (23), “Zephyr” (29), “Wudi” ((33), “Wyuna” (47). Day-2 of the UK Sailmakers Summer Saturday Series took place last Saturday June 27 with 25 boats in attendance: 8-IRC, 7-HKPN, 6-Sportsboats and 4-Dragons.